The user friendly Taiko Open Top drum comes in many sizes with a snap lock metal gripper and stopper to act as a security seal for better locking performance. UN approved for packaging higher viscosity chemicals, solid and emulsion products. Excellent for storage of foodstuff in paste form in a cold room at low temperatures. The removable cover is ideal for reworking and finishing work. 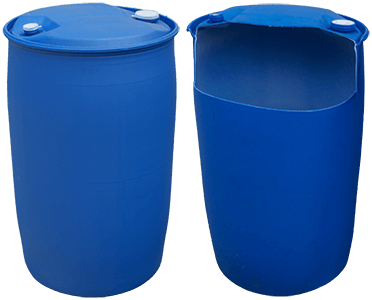 Complete draining of the contents and easy cleaning are ensured due to the smooth inner wall surface of the drum and lid. Complete removal of the content means less problems with disposal at the end of the drum’s useful life. Minimal risk of product contamination. Proven in service throughout the world, even under extreme climatic conditions and also under harsh environments. Savings on filling and sealing costs. 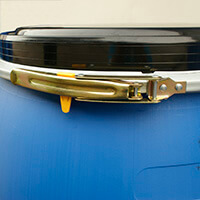 Drums can be reconditioned for reuse and have a relatively high resale value. No repainting required. A venting valve enables the filling of drums with warm of hot fill products up to 80°C without causing vacuum formation (negative effect on stacking). The full opening makes it easy to use stirring equipment. This is important for products with a tendency to settle or which have to be provided with additives before processing such as paints, wetting agents, dispersion agents, etc. The smooth drum lid/body offers a large solid surface for product identification by labelling, stencilling or silkscreen printing. 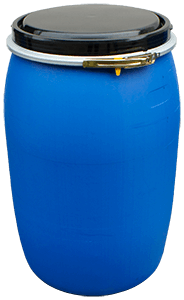 The tighthead L-Ring HDPE drum is renowned internationally as the most successful, large size blow moulded packaging product using the single operation technology. UN approved for the storage and transportation of hazardous, aggressive and non-hazardous chemicals worldwide by shippers and transporters. The optimally drainable L-Ring drum reduces liquid residue to less than 100ml when emptied at an angle up to 20° resulting in less wastage. The smooth, seamless walls and optimal draining make for quick and thorough cleaning at lower cost. Minimal residue when drums are empty means easier recycling and less problems with disposal at the end of the drum’s useful life. 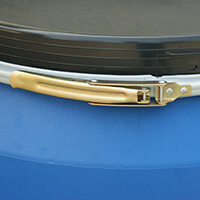 Lighter tare weight against metal drums means savings on transportation cost. 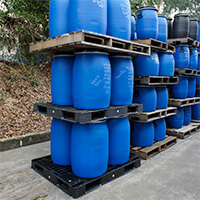 The drums can be utilized for up to 10 trips, depending on the products packed and transport conditions. 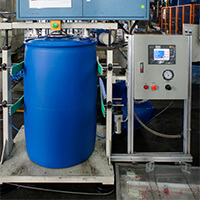 It is important, however to refill the drums with the same product or substance of the same product group. Before every shipment, closures and seals have to be checked and replaced if necessary. 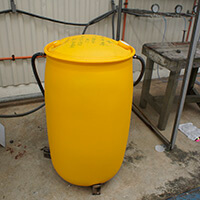 Minimal risk of product contamination even under extreme climatic conditions and when stored outside. 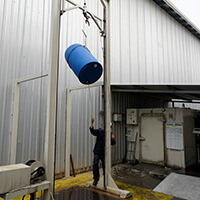 The drums may be used for hot fill products of up to 80°C. Special venting caps are recommended to avoid a vacuuming effect. 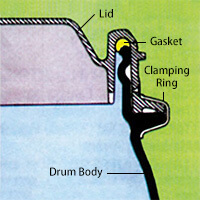 Special degasifying closures are available for the tighthead L-Ring drums and are liquid-tight to avoid the build-up of overpressure. Dimensional compatibility for loading into international freight containers. Identification by means of silkscreen printing, stencilling and labelling is possible. Less susceptible to impact damage than steel drums. The drums do not require repainting.